D'Arcy Beth Carden (born Darcy Beth Erokan, January 4, 1980) is an American actress and comedian. She is best known for her starring role as Janet on the NBC sitcom The Good Place (2016–present). Darcy Beth Erokan was born and raised in Danville, California. Her father, Dennis Erokan, acted in local community theater and founded the Bay Area music magazine BAM. Her mother's maiden name is Engelfried. She has two sisters, Miranda and Laney, and one brother, Will. Darcy added an apostrophe to the spelling of her name when she was in junior high to emulate D'arcy Wretzky of the band The Smashing Pumpkins. In 1998, she graduated from San Ramon Valley High School and later received a Bachelors in Fine Arts in Theater from Southern Oregon University. After graduating from college, she moved to New York City. Carden joined Venus Rising, a musical-comedy company, and in 2001 she appeared in Seven Hearts, a musical about friends living in San Francisco. The following year, she starred in a holiday show where the main character is upset that her family is obsessed with her selfish sister's wedding rather than keeping up their Christmas spirit. She also served as director and producer. A friend invited Carden to an improvisational sketch comedy show at the Upright Citizens Brigade Theatre (UCB). Carden enjoyed the show so much, she signed on for classes and kept progressing with the group. She started with UCB in 2004 and later toured with the UCB Touring company. By 2010, she was using her married surname Carden professionally when she was a cast member for The Ride, an interactive show performed on New York City tour buses. In 2013, Carden co-created and co-starred in "Terrible Babysitters", a Web original about two parents who want to find a babysitter. Early on while pursuing her acting career, Carden also worked as a nanny for Bill Hader. Carden had a recurring role on the Comedy Central series Broad City, a series created by fellow UCB alumnae Ilana Glazer and Abbi Jacobson. Carden has also appeared on Inside Amy Schumer and Crazy Ex-Girlfriend. She also had a small role in the movie Other People. In 2016, she began starring as Janet in the NBC comedy The Good Place. The show stars Kristen Bell and Ted Danson. Carden's character is a live virtual assistant. In addition to working on The Good Place, Carden has a recurring role in the HBO series Barry, starring Hader, which premiered in 2018. Carden married producer Jason Grant Carden on July 31, 2010. In 2013, the couple relocated from New York City to Los Angeles, California. 2013 Inside Amy Schumer Emily Episode: "Meth Lab"
2015 Adam Ruins Everything Future Wife Episode: "Adam Ruins Giving"
2016 Crazy Ex-Girlfriend Eyebrows Girl Episode: "I'm Going to the Beach with Josh and His Friends!" 2017 Veep Congresswoman Episode: "Blurb"
2018 American Dad! Sophia (voice) Episode: "Mean Francine"
2019 Last Week Tonight with John Oliver Homeowner Episode: "Mobile Homes"
^ a b "The Birth of Darcy Erokan". California Birth Index. Archived from the original on January 18, 2019. Retrieved January 18, 2019. ^ a b c "D'Arcy Carden". TVGuide.com. Archived from the original on August 4, 2018. Retrieved 2016-10-16. ^ a b c d e f Barney, Chuck (September 6, 2016). "Danville's D'Arcy Carden: In heaven in new NBC comedy 'The Good Place'". The Mercury News. San Jose, California. Archived from the original on August 3, 2018. Retrieved October 16, 2016. ^ Jung, E. Alex (October 6, 2017). "The Good Place's D'Arcy Carden Shows Us How Janet Fell on Her Face 40 Times". Vulture.com. New York. Archived from the original on August 3, 2018. Retrieved October 6, 2017. ^ a b c "'The Good Place' star D'Arcy Carden's rise from UCB". New York Daily News. September 21, 2017. Archived from the original on August 25, 2018. Retrieved October 6, 2017. ^ Craig, Pat (August 17, 2001). "Venus Company on the Rise Once More: This Time Out, The Theater Group Showcases an Innovative Piece". Contra Costa Times. Walnut Creek, California. p. 25. ^ King, Paula (December 18, 2002). "Venus Rising Makes Magic with Holiday Show". Contra Costa Sun. Contra Costa County, California. p. 16. ^ a b c d Andreeva, Nellie (2016-03-15). "'Good Place': UCB Performer D'Arcy Carden Cast In Mike Schur NBC Series". Deadline. Retrieved 2016-10-16. ^ "D'Arcy Carden". Upright Citizens Brigade. Archived from the original on August 11, 2018. Retrieved October 16, 2016. ^ Huguenin, Patrick (October 9, 2010). "New NYC tour bus gets riders up close and personal". New York Daily News. Archived from the original on August 25, 2018. Retrieved 2016-10-16. ^ "In Focus". The Ellwood City Ledger. Ellwood, Pennsylvania. July 5, 2013. p. 24. ^ " "Terrible Babysitters". Blip.tv. Blip Media. Archived from the original on August 23, 2015. ^ Bucksbaum, Sydney (January 11, 2018). "'Saturday Night Live' Used to Terrify Bill Hader". Nerdist.com. Retrieved December 27, 2018. ^ a b Malkin, Marc (March 22, 2018). "Bill Hader on Why He Was "Very Nervous" to Play a Hitman in 'Barry'". The Hollywood Reporter. Retrieved December 27, 2018. ^ Jenson, Jeff (September 19, 2016). "'The Good Place' Review". Entertainment Weekly. Archived from the original on January 16, 2018. Retrieved 2016-10-16. ^ Carley, Brennan (2017-09-23). "The Good Place's D'Arcy Carden Would Like You to Know She's Not a Robot". GQ. Archived from the original on August 14, 2018. Retrieved February 9, 2018. ^ Romain, Lindsey (January 4, 2019). "Visit Janet's Void from 'The Good Place' Thanks to This Live Stream". Nerdist.com. Retrieved January 5, 2019. ^ "Can D'Arcy Carden Do Everything?". Brooklyn Magazine. September 26, 2017. Archived from the original on August 14, 2018. Retrieved January 12, 2018. ^ a b "D'Arcy Carden". NBC. Retrieved 2016-10-16. ^ Rich, Katey (June 22, 2018). 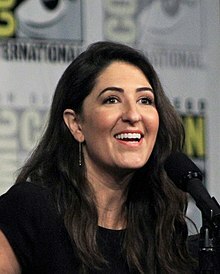 "How D'Arcy Carden "Yes, and"-ed Her Way to Stardom". Vanity Fair. Archived from the original on January 18, 2019. Retrieved August 24, 2018. "16 Smart Questions for D'Arcy Carden". SmartGirls.com. October 19, 2015.